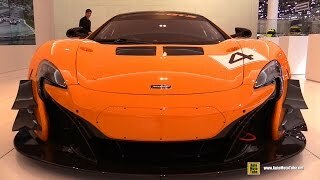 McLaren introduced its all new McLaren 650S GT3 at the 2014 Geneva Motor Show as a successor to 12C GT3 and with an intention to compete Ferrari and Lamborghini. Adored with new aerodynamic features, McLaren 650S GT3 2015 gets a new aerodynamic package with an upgraded gearbox and new chassis components. Company didn’t confine itself till here but made a march ahead by introducing some new features in its interior also. 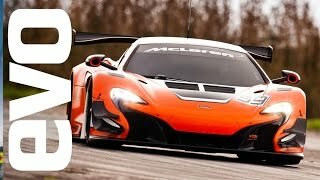 Let us have a look at the review of McLaren 650S GT3 2015 to know more. Interior of McLaren 650S GT3 2015 is concentrated upon comfort and driver safety. Talking about comfort McLaren has introduced carbon-fiber monoCell chassis after revising its components, accompanied by an all new roll cage which avails more leg and headroom, making your long sprints easy to cover. Sports seats are fitted inside with six-point harness and bespoke molded inserts. As a part of technological advancement, a digital dash is mounted behind the sports steering wheel to acknowledge the driver about all vital information. McLaren 650S GT3 2015 interior in all is a comfortable ride giver with new features to assist the driver for a safe and informative ride. 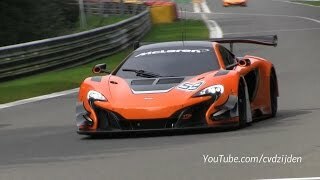 Exterior of McLaren 650S GT3 2015 is a step ahead of its street legal sibling 650S. Starting with the front fascia of McLaren 650S GT3 2015 you’ll notice a massive carbon-fiber splitter amidst better air intakes sitting on each side. 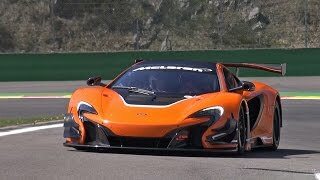 Not only this, hood is also provided some additional cooling features in it, joining the league to give McLaren 650S GT3 some aggressive looks. Moving towards the rear fascia of McLaren 650S GT3 2015 you’ll find revised air intakes on sides to deliver more fresh air to engine. Side sills also get a hand of revision and this time make sure that driver doesn’t loses control even at high speed. Adding to the menacing looks is a massive carbon-fiber wing making sure that there is sufficient airflow around as well as also providing necessary downforce. 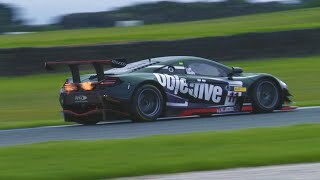 The McLaren 650S GT3 2015 gets its power through same 3.8 liter V8 twin turbo engine found in 12C GT3 delivering same 493 hp of total output. However change comes with the all new six-speed sequential transmission with improved shifting and improved engine cooling. Though performance figures of McLaren 650S GT3 2015 are not yet revealed but they’ll be sure above its highly successful predecessor.